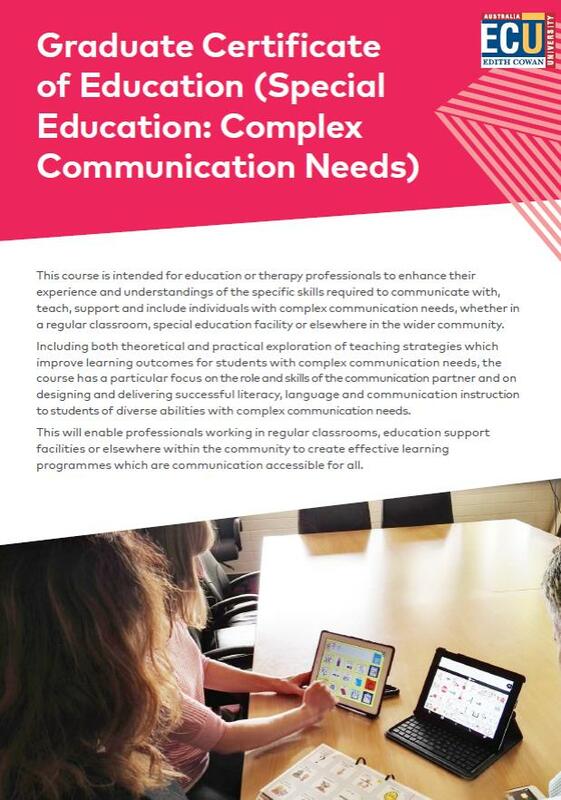 You may have heard about the Graduate Certificate in Education (Special Education: Complex Communication Needs), the first course of its kind in Australia addressing contemporary practice to support the communication and literacy of students with complex needs. Although enrolments have closed for the Semester 1, 2019 course you can contact the lecturers regarding the next intake. DDWA is also excited to offer a new unit as part of this course in 2019 in contemporary approaches to understanding and responding to behaviour. This unit addresses the needs of a wide range of students including complex students who are difficult to support due to behaviours of concern. The course is open to teachers, therapists and other professionals working with people with complex needs. There is also a limited number of places for auditing students who do not have the pre-requisite undergraduate degree, such as Education Assistants or family members. New students enrolling this week should be aware that the enrolment process can take some time, and if their place is not confirmed by 2 March they should still attend classes. Contact lecturer Laura Jones for more details at laura.jones@ecu.edu.au. See the attached flyer for more details or contact Dr John O’Rourke, senior lecturer in the School of Education on 6304 6935 or at j.o_rourke@ecu.edu.au.